The original Bullet Space Pen was conceived in July of 1948. Paul Fisher was soon machining a new pen design shaped from solid aluminum. It became the first Fisher ball point pen, the #400 Bullet Pen, is arguably the most popular pen of the twentieth century. 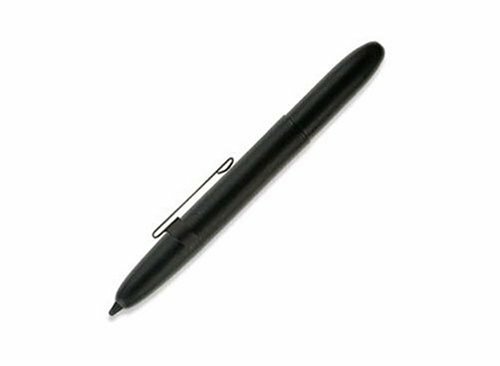 This pen is now all brass with a Matte black finish, removable clip and Stylus tip.When closed, the Bullet Space Pen is the perfect size to carry in your wallet, pocket, purse, car glove box, organizer or toolbox. When open it's a full sized, evenly balanced writing instrument. The patented ink cartridge was designed by Paul Fisher for NASA in the 1960's enabling it to write in temperatures from -30 to +250 degrees Fahrenheit, under water, in zero gravity, at any angle, even upside down.